My answer to both questions is the same, really. I think The Mysterious Benedict Society would make a fantastic adventure movie and I'd love to see it! However, at the same time, I'm not sure that I really WANT it made into a movie because it already works so well in my head. Plus I just love the book so much that I'd be mad if Hollywood messed it up. My tip to the producers would be to make sure they cast Constance WELL! And I don't know how that could be done well. 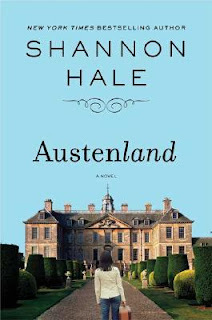 Another book that would make an awesome chick flick movie is Austenland: A Novel which I read a few years back. It fits the I-love-Pride-&-Prejudice-and-especially-Mr.-Darcy bill very well and should delight, oh, a half million (give or take) female viewers. It reads like a chick flick and its a fairly fun story so I'd give two thumbs up to turning that one into a movie. What about you? What was your answer to this question? Yes, Austenland would be a fun movie. I enjoyed the book. There are quite a few movies that I've been bummed about because producers did such a bad job transferring them to the screen - Inkheart was one of them! Excellent idea! I thought along the same lines you did... my movie vote goes to Rigler's Confessions Of a Jane Austen Addict :) There's no such thing as too much Austen! These are new-to-me titles. Thanks for coming by my place and leaving a comment. Ooo...I'm adding Austenland to my TBR stack! My word verification is godode. God ode...an Ode to God :-) doesn't that sound wonderful! I wouldn't mind seeing either of those books being made into a movie, especially Austenland which would be great fun on the big screen. I have the Mysterious Benedict Society on my shelf now from the library ... I'm looking forward to reading it! I have to read that series. Everyone is talking about it. I have got to get Austenland read! I agree with both of your suggestions! I'm reading the second Mysterious Benedict Society book aloud to my kids right now, and we're loving it as much as the first. My choices were Outlander by Diana Gabaldon (I posted casting suggestions with pictures) and The Walking Drum by Louis L'Amour. I have Mysterious Benedict society on the shelves and will be reading at some point soon. It probably would make a good movie. Thanks for visiting on BTT. Yes and Yes! I just added a comment to my post with an addendum of Austenland. I didn't realize you had said that. Okay, I'll have to look up a copy of Austenland!